Their oeuvre and specifically their song “Reigning Men” has left its imprint on popular culture and in this case the fashion industry as it inspired Sharon Takeda to modify the title of said song to fit the exhibition of a spanning three hundred years of menswear based on a thousand piece acquisition at the Los Angeles County Museum of Art in 2008, which was purchased by the museum from the European collectors and dealers Martin Kamer and Wolfgang Ruf. 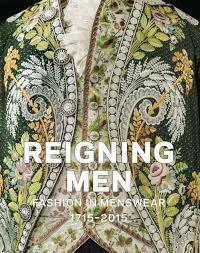 Reigning Men: Fashion in Menswear, 1715-2015 became the world's largest exhibition of men's clothing staged to date, running the gamut from outfits worn by aristocrats, dandies, macaronis, mods, punks, metrosexuals and everything in between. The exhibition finally found its way down under following its debut in Los Angeles in 2016, where it is currently on display to coincide with a worldwide renaissance of menswear. The exhibition is organised thematically, which has the advantage over a chronological arrangement that individual pieces can be show next to each other in juxtaposition to compare and contrast the past and the present along with the evolution in between. Needless to say that no matter if you are an initiated fashion aficionado or not, it proves to be difficult not to be intrigued by the discovery of how what eventually became the norm in the 21st has evolved to the current state and the connection between seemingly unrelated cultures and how they have influenced each other that are expertly pointed out, think East / West or Military / Leisure wear. The exhibition was carefully curated by the Powerhouse’s senior curator Roger Leong who accomplished a to create an eclectic cross section of very different ways of dressing away from what the mainstream perceives to be the norm. The attention to details does not stop with the menswear but extends to the accessories and hairstyles of the mannequins giving the exponates another dimension and adding historical significance. Prestel Publishing’s book is not unlike the one on Anton Corbjn an opulently illustrated essential accompaniment and extension of the exhibition, documenting three hundred years of men’s fashion. Following the curatorial path that forms the foundation of the exhibition, it traces and captures the essence of different eras and helps in develop a new sense of appreciation for fashion no matter if you are into tailored garments from Savile Row, Zoot suits or the subversive designs of Vivienne Westwood and Rei Kawakubo. A feast for the eyes that goes beyond mere fashion as it documents cultural interactions and developments.